Lily and I are invited to a wonderful Mother/Daughter Valentine's Party tomorrow. 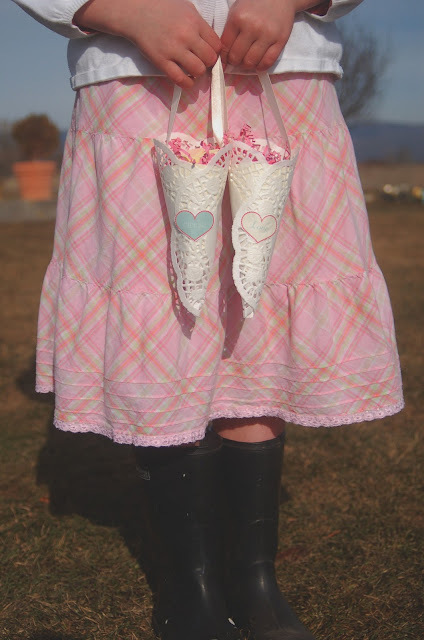 We came up with this idea for sweet Valentines to share with 12 other little girls. They were so simple to make. Just take a doilie...any size will do. We used an 8 inch size round doilie and it was perfect. Wrap it into a cone and secure with double sided tape. For the inside, measure a piece of card stock to fit, and just make another little cone to slip in. Attach a ribbon to the inside of the doily with tape, so it won't show. The little hearts on the front are a freebie from Simple as That . She has the most fantastic taste...thanks Rebecca!! Now, fill it up with sweet treats. Lily actually came up with the idea for the heart topper pencils. We used pink foam and felt. Just cut out a desired heart and make two slits for the pencil to pop through! I also used the package of doilies to make a simple garland. I think I paid $1 for a package of 32. I thought I may as well use them up. Just fold the doilies over and secure with a little tape. I taped the ribbon to the inside so the doilies would not slip. Isn't this a fun time of the year? 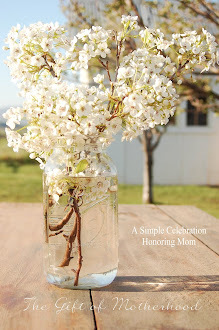 I found your blog from Amanda's over at Home Grown and Beeyoutiful. I look forward to coming back here often. You have a lovely blog! You sure know how to capture some sweet photos. We were doing valentines the other day and came across some doiles. I've had them for years and could never come up with anything creative to make. A really great idea. Oh how cute. I love your doilie cone. Also love that pink skirt! Thanks for sharing. First, I wanted to thank you for visiting and becoming a follower on my blog. We have been dealing with the sickies here, one after the other. I decided to check out your blog. And I love it! It looks so relaxed and very cozy. I'll be coming back! Hi Julia. You are the winner of my giveaway at Cozy Blanket. Please send me your mailing information at grammypetals@yahoo.com. Thank you so much for your thoughtful comments regarding the passing of my cousin. Thanks so much for your sweet comment on my blog; I'm so happy that the recipes we've shared there are making tummies happy in your home!